April is a great time to fill in bare spots in your lawn. Use a stiff rake to remove any loose debris and left over leaves from winter before sowing the grass seed. Apply a starter fertilizer according to the package directions. 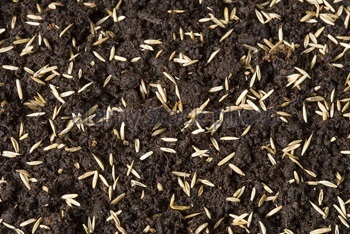 For small areas and spot seeding, you can simply use your hand to sprinkle the grass seeds over the area. This picture gives you a good idea as to how thick the seeds should be. Too much seed is worse than not enough. If it is sown too thickly, it will quickly choke itself out and you will be back to square one. After seeding, water the grass seed in using a gentle spray or, seed just before a spring rain is expected. It is important to keep the seeded areas moist for a couple of weeks, but not to the point of standing water. Mow the new grass once it is 3-4” tall, or the height of your mower blades. Tall fescues are a good choice for our area. 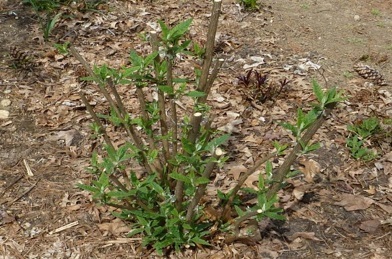 Cut back butterfly bushes (buddleia) to six to eight inches above the soil line. Before pruning Hydrangeas, it is important to know if yours blooms on ‘old wood’ or ‘new wood’ if you want to enjoy the show. Old-wood bloomers should be cut back immediately after the blooms fade. New-wood bloomers can be cut back now. Roses that have started budding out can be pruned to remove any branches or tips that are brown from winter die-back and to remove the oldest, thickest canes that aren’t producing healthy new growth. This is also the time to pull the mulch back away from the crown. If you are lucky enough to have a compost pile or bin, this is a good time to stir it up! Turn it over several times to loosen it and to get it ready to use on your garden and flower beds. Don’t forget to deadhead the fading spring bulbs. Cut the flower stem off, leaving the leaves until they have turned yellow or brown. Fertilize the woody ornamentals now. Just use the recommended amount on the package and lightly scratch it into the soil surface. No need to dig deeply. Clean your bird feeders, bird baths, and bird houses if they haven’t been occupied yet. 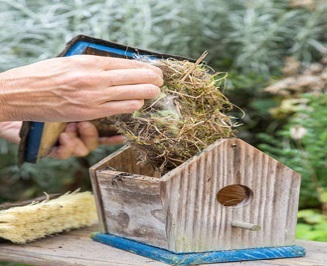 Place lint from your clothes dryer and short pieces of string and yarns on tree and shrub branches for the birds to use in building nests. It’s always fun to find a piece of colored yarn hanging from a nest knowing it was once yours! The last Friday of April is celebrated as Arbor Day. Plant a tree in your yard. An even better idea would be to call your local park and arrange to plant a tree there. Get the kids involved. Maybe there is a school or playground in need of trees. 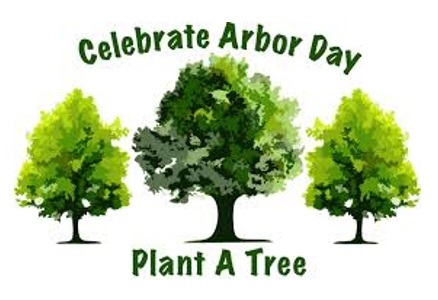 Make a donation to the Arbor Day Foundation or to your local park if you are unable to plant a tree yourself. Trees are very important for removing tons of carbon dioxide from the air, producing oxygen, providing shade and relief from the summer’s heat. Did you know; Cincinnati has 35 communities listed as Tree City USA communities? Planting trees is even more important than ever with the onslaught of Emerald Ash Borers in the tristate and the Asian Longhorned Beetle in Clermont County. Hundreds of trees have been lost to these two insects in our area alone.